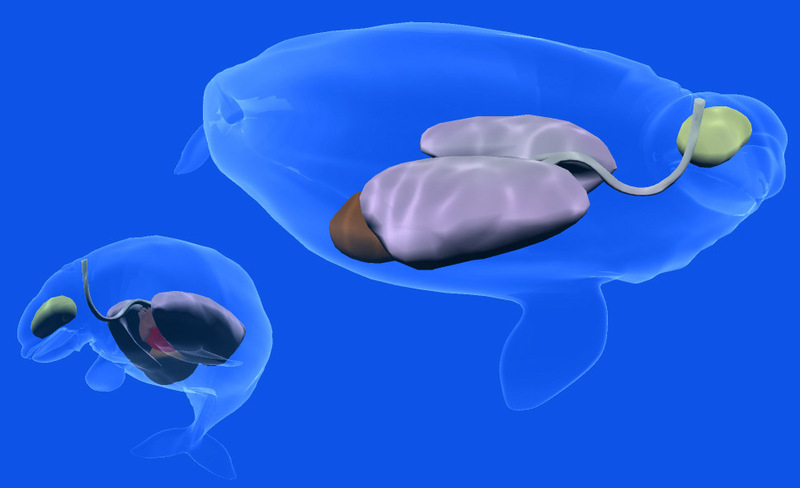 realistically swimming Beluga in a wild grouping (pod) created via 3d real-time graphics and artificial intelligence systems. Technology is becoming increasingly incorporated into exhibit design. Both on the floor and extended online. Our work focuses on the design of a multimedia interactive exhibit for an aquarium gallery. The goal was to use technology to better immerse and engage the visitors in complicated educational concepts about the life of wild belugas. We were interested in encouraging deeper exploration of the content than what is typically possible via wall signage or a video display. 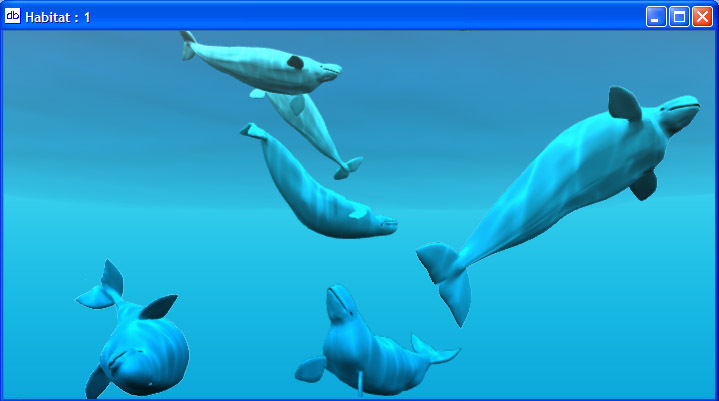 The beluga simulation uses extremely realistic graphics and is based on an intelligent system that allows the virtual belugas to learn and alter their behaviour based on the visitor interaction. It was informed by research data from the live belugas, (e.g. voice recordings tied to mother/calf behavior) obtained from interviews with the marine mammal scientists and education staff. Observation and visitor studies determined that visitors rarely visit alone, so the interface was designed to encourage collaboration. 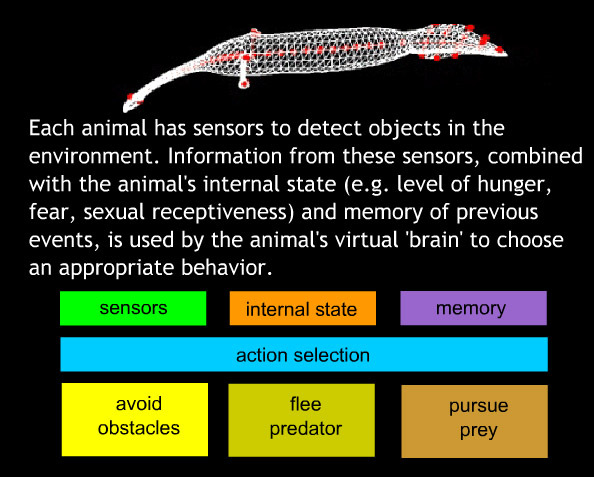 It allows visitors and their companions to engage in “what-if” scenarios of wild beluga emergent behavior via a 3D interactive that uses artificial intelligence, physically based animation, and real-time graphics. The program could be linked to the aquarium web site to allow for an extension of the aquarium visitor experience. The design process focused specifically on visitor experience and ensured that visitor input was taken into consideration early in the design process. Visitor studies also informed the design process from the formative evaluation to the summative evaluation. The use of technology allows the exhibit to present an experience beyond what has been previously possible. This work addresses the scientific and design process issues of creating an extremely realistic 3D simulation of a wild beluga whale pod for a major aquarium that is situated next to a group of real beluga whales in an integrated marine mammal exhibit. The Virtual Beluga Interactive was conceived to better immerse and engage the visitors in complicated educational concepts about the life of wild belugas compared to what is typical possible via wall signage or a video display, thereby allowing them to ask deeper questions and hopefully have deeper insights into the life of beluga whales. The simulation is specifically informed by research data from the live belugas, (e.g. voice recordings tied to mother/calf behavior) obtained from interviews with the marine mammal scientists and education staff. The collaborative user interface allows visitors to engage in “what-if” scenarios of wild beluga emergent behavior via a 3D interactive that uses artificial intelligence, physically based animation, and real-time graphics. We document a development and design process integrating design objectives, biological data capture from wild animals, scientific ethogram data of animal behavior and artificial life software development to create a synergistic interactive that teaches deeper insights into the life of beluga whales. internal anatomy of the beluga as it naturally swims about. Digital Biology Site WebLink: Digital Biology Site. Vancouver Aquarium site WebLink: Vancouver Aquarium Marine Science Centre.